Add a style statement to your bathroom with this GROHE Eurostyle bathroom tap in a contemporary Moon White finish. 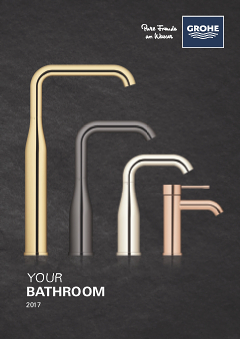 GROHE taps not only look great but also offer outstanding durability and performance – all backed up by German engineering excellence. This single-lever tap with a pop-up waste is easy to use with an ergonomic handle and SilkMoveES technology for the effortless and energy-saving control of water flow and temperature. As cold water flows when the lever is in a central position, no hot water is wasted when washing hands or brushing teeth. Its EcoJoy technology also reduces water consumption by up to 50% without reducing flow rate. As part of the Eurostyle range of bathroom taps, this basin mixer seamlessly combines with other products in the collection for a complete and coordinated bathroom look.